So, welcome to the coffee shop, Badger, I thought it would have taken you much longer than it has to find out what I’ve been up to. I underestimated you, you furry flump. [Tom twiddles his own tooth-pick around his mouth and then spits it out as it nearly chokes him] So, I guess you’ll be wanting to know the whereabouts of that moaning missy of yours? Where is Belinda, you nonce? Oh, your Moaning Myrtle is alive – for now – but she doesn’t have long! [Badger bares his teeth] Is that song that’s playing called Belinda? You’re sick! I always thought it was an odd thing for a human to employ an animal to run his blog for him. I always thought you were an idiot! You prayed on the fact that I’ve been trying to get on the TV and in the movies. When you offered me the gig, I thought why not… but how could you stoop so low? Kidnapping Belinda just to improve this crappy blog!!! Stoop so low! I had to try something. Who wants to listen to a Badger talking to people every week. I needed to spice it up with a better back-story. Something to keep people interested. I take your wife, you suddenly become a more interesting character – not just a woodland creature who scratches, shits and loves peanuts but a broken, tormented soul who scratches, shits and eats peanuts. You Muppet! She’s the love of my life! How could you do this to me? Do you know what I’ve been through? No, not really I don’t read the blog myself… bit busy for all that stuff… but, you know that it’s all about entertainment these days, Badger! You’re the dreamer! So, killing my cousin, Brock, is entertainment? Oh, don’t be ridiculous, that was just good luck. He got run over. You lot do that, you know… if you didn’t the phrase ‘road-kill’ wouldn’t exist! So, if you made everything up about Don Warren, he really doesn’t know where I am then? I thought you said you didn’t read the blog? But how did you know that I’d testified against Don Warren? Helga’s uncle Harry belongs to W.A.R.P – You know, the Witness Animal Relocation Programme. His owner filled me in, that’s why I chose you – you are an interesting character, Badger, if maybe a little boring and vulgar. Belinda Carlisle’s Summer Rain is now playing. [Badger snarls again and scratches, shrugging off his wide-brimmed hat, which looked pretty daft to be honest] Are you doing this on purpose. That’s Belinda Carlisle isn’t it? What’s wrong with you Tom – I mean what do you want? How do I find Belinda? Good choice of title considering the weather don’t you think? Well, that’s the right question, stinky! The blog has finished so I don’t want you cropping up anywhere else and having a pop at me on the world wide web, so I just needed some reassurance, some leverage if you like. You say anything about this and my fiendish kidnapping plot to improve my blog stats and I tell Don Warren where you are! Capiche? What do you mean – give my position away to Don Warren? This is going on the blog isn’t it! He’s bound to find me now, just by searching the woodland areas of the south coast… Not that I want to give him any tips or anything! Don’t worry about that Dumbo, no-one’s really reading it – that’s another reason I want you out – I need to do something a little more interesting and sensible. But the main thing is I need you to resign as I can’t afford to pay out the rest of your contract – so do we have a deal? So tell me – where is Belinda? You Dingbat! [Badger screams and wiping down his wet fur, darts off into the gloaming across the seafront. He races past a few startled onlookers across Southsea common who are all pointing at the strange sight of a Badger racing across the wet grass. Suddenly, Badger can hear Holding Out For a Hero by Bonnie Tyler. 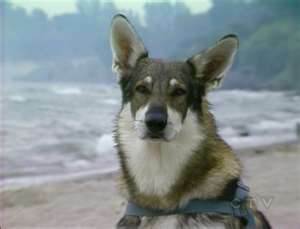 He stops and looks around, confused by this seemingly magical soundtrack that seems to be following him across the common as he races to save his one true love] I’m coming Belinda, just hang on! 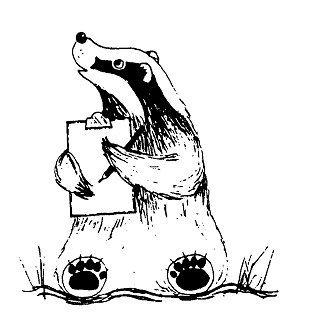 Intermission… as we wait for Badger to get across the common – dum, de dum – right, on we go. 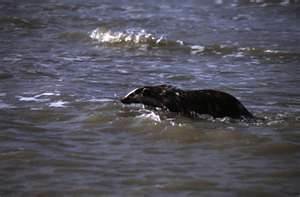 [In the dip of a wave created by the plundering Isle of Wight Ferry, a furry black and white face bobs above the waterline. What bloody well kept you! You halfwit! Coming my [Badger swallows seawater] little Buttercup! Don’t rush will you, love… I’ve only been missing for about three months! Be there in a [swallows some seaweed] tick, Angel-cake! Angel-cake!!! I would have been fishcake if you’d left me any longer! No thanks to you! Where have you been anyway? Then I got Weasel to look for you, and then he used Ron and Reg to track you down and here I am, rescuing you. And all that took months did it? Bet you’ve been having a great time with the new job and all that, hardly missed me, I bet. Now that’s not true my pretty Pumpkin. I’ve been a total mess without you – the sett is just not the same without you. Isn’t that a line from Shrek? 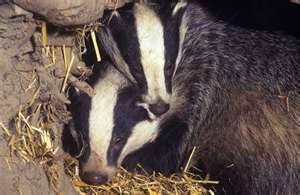 [Badger smiles and nuzzles his wife – she nuzzles him back and then nips him] Ow! What was that for? That was a love-bite, dear! Ahh… thanks my fluffy bundle of cuddles. Quick come on, there’s no one on that bus… come on, hero, let’s sneak a lift home. So, when have you next got to work? Erm, about that. It looks like I might have to go and sign on the Mole! What? You’ve lost your job! 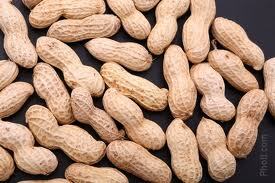 We’re living off peanuts as it is… how are we going to survive? Well, a few of my guests didn’t take their peanut treats, so I reckon we should be okay for a while, and something will come up, it always does! Well now those furry idiots have gone, I can get on with another blog. 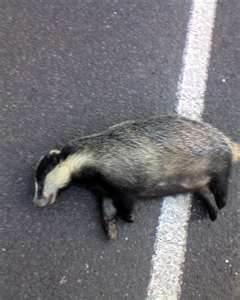 If you really want to know the latest on Badger, he has just signed off the Mole and is due to start filming the first episode of the brilliant Tim Burton’s Animal Crimewatch on Channel 4 – his first role will be to play a murder victim in the reconstruction of Brock’s death.